Adam is known for his fabulous basics and a tailored boyfriend blazer like this one is the perfect Fall staple! The longer cut looks great with skinny jeans, leggings or shift dresses. It has a nice fit and you will never tire of the classic style. It’s hard to believe you can get this kind of quality for the price. I just purchased this blazer myself and will surely live in it. Check out my OpenSky video for more details! This chic jersey dress from Haute Hippie is right on trend for Fall with the burgundy color and wrap draping. It is universally flattering on all figures too! Pair with a blazer for work and ditch it at night for cocktails. A great replacement for your LWD. While we are still obsessing over the amazing Spring/Summer hairstyles we saw earlier this month at Lincoln Center for Mercedes-Benz Fashion Week, we’re also ready to step up our hair game for this season. 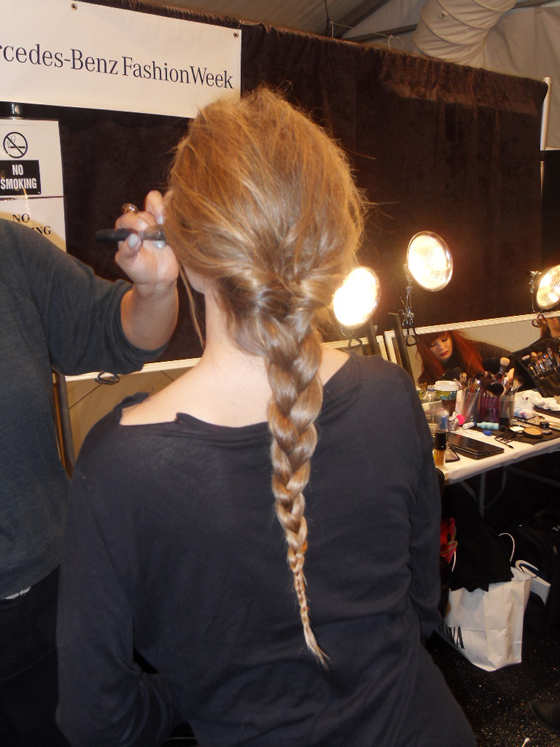 Luckily, PageDaily was backstage at last February’s Fall 2011 Fashion Week, too, and caught up with the best hair experts in the business who gave us all the tips, tricks and product picks you need to get flawless hair this Fall! Size may not always matter but when it comes to hair this Fall, bigger is better. Models at Bibhu Mohapatra, Cynthia Rowley, Marchesa, Vivienne Tam and L.A.M.B. sported dramatic updos like bird’s nest buns and retro pompadours. Effortlessly chic textured ponytails were also a runway favorite in February. 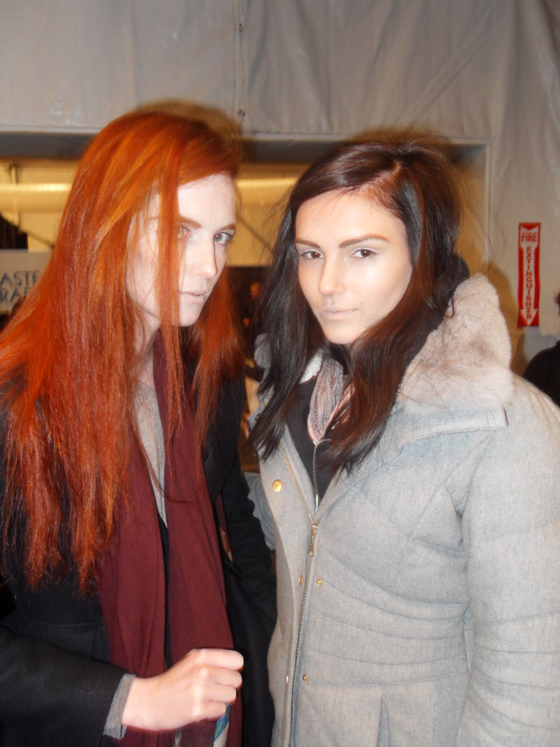 They were windswept and natural at Rodarte; low and grungy at Tibi; and polished ‘60s mod on the side at Kate Spade. This trend is perfect for Fall’s laid-back looks but can also add some attitude to a polished black dress. If last February’s shows were any prediction, we’ll be seeing lots of tousled, relaxed braids this Fall like the ones dressed with turbans at Mara Hoffman or the multiple strands we saw at HERCHCOVITCH; ALEXANDRE. We love that this look works best with dirty hair! We saw romantic undone curls and waves backstage at Chris Benz, Prabal Gurung, Rebecca Minkoff, Vena Cava, Christian Siriano and Rebecca Taylor. You can achieve this easy-to-do look at home with a little help from a styling product like and by either curling hair with a small barrel curling iron and then brushing out or loosely braiding it and the applying heat with a blow dryer or flat iron. If it looks morning-after chic, you’re on the right track. If you’re not one to go crazy styling your hair, one way to update your look this Fall is with a statement-making part. Stylists’ backstage Nicole Miller and Proenza Schouler shows created severe center parts while those at Timo Weiland and Tadashi Shoji styled defined side parts. The only tool you need is a tail comb!